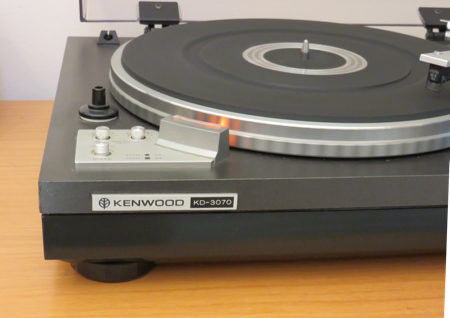 In recent years vintage Kenwood gear has been rapidly appreciating in value, and just a quick look at this turntable will tell you why. First of all its build quality is astounding, it is built like a Sherman tank…literally! It’s plinth incorporates resin-concrete and it’s platter is extra heavy weighing in at 3lbs, which is intended to give the platter further stability through increased inertia. Kenwood boasted in their advertising material that this turntable wouldn’t jump even if you sat it on a speaker! As a direct drive turntable it features an advanced 20 pole, 30 slot servo controlled DC motor with high torque for rotational stability, combined with the heavy 3lbs platter mentioned earlier, you get a very stable turntable with a stock Wow & Flutter of only 0.035% and only -70dB Rumble. In addition to what has already been mentioned here is a quick overview of features; a newly developed (in 1977) tonearm, micro-ball bearings, anti-skating adjustment, semi-automatic function, pitch control, high-visibility strobe light, viscous dampened cueing device, low capacitance phono cables, stylus pressure direct readout counter and built in insulators. The tonearm on this model is a particular fave with audiophiles, it’s center of gravity is very closely aligned to its axis of rotation. This makes it extremely forgiving when choosing a cartridge allowing you to push the specified limits of cartridge weights. The tonearm was developed especially for the KD-3070 by Kenwood to ensure Low Mass, Low Resonance, High Trackability and improved Frequency Response. To achieve this Kenwood redesigned not only the geometry of the armature but also the materials used to make it, right down to it’s ball bearings. And the end result is magical. If your a direct drive fan, then this is certainly one that deserves an audition. Many audiophiles like to tweak this model with new feet or spikes, record weights and various platter mats. With the exception of a mat and an Ortofon cartridge I am running my model stock, and loving every minute of it! If you remember listening to your favourite tracks on the radio in the late seventies, then the chances are they were being played on a Technics turntable. The Technics SL-1600 Mk2 is a studio grade turntable and one of the most popular and sort after direct drive turntables amongst vintage-audio enthusiasts and is sometimes described as a fully-automatic version of Technics manual SL-1200 which to this day is the choice of many DJ’s. Introduced sometime in late 1978 the Mk2 was released hot on the heals of the original SL-1600 and saw a number of improvements that today make it a much more attractive artefact for collectors then the original. First and foremost the standout feature of this table is its quartz-phase-locked speed accuracy with pitch control of +-6%. The DC servo also features high-torque for fast starts and a platter braking mechanism also ensure there will be fast stops! Technics boasted the torque of the DC servo was so high that it could handle 100 tonearms each with a 2g cartridge! The fully automatic system is enhanced by an infrared sensing system built into the platter that automatically detects the record size loaded and also assists with the auto-repeat function. The stability of this turntable is excellent. Firstly it is fitted with an aluminium plinth and secondly it has a double isolated suspension system, the outer diecast aluminium chassis is fitted with tuned set of isolators while the inner base that supports the platter, motor and tone arm, is made of TNRC anti-resonant material specially developed by Technics which is supported by another set of isolators and a double insulated platter with a rubber mat on the bottom as well as the top. This means you are very unlikely to experience feed back on this table. The tonearm has been engineered to a high-degree of accuracy and has a wide operating tolerance including a height adjustment of 6mm allowing you to experiment with huge selection of cartridges. Other features I love about this artefact is that all the controls are housed outside of the dustcover for easy access. It also comes with a strobe light and a stylus illuminator for use in low-light conditions. My unit is fitted with the original Technics 270C Moving Magnet Cartridge that has a wide range of styli available for it including conical, elliptical, shibata and SAS. 1977 JVC JL-A40 Professional Turntable for both Stereo & Quadraphonic! JVC is a bit of a dark horse in the vintage audiophile community. While not widely acclaimed IMHO during the Golden Era of the 1970s they produced many beautifully designed and innovative technologies with excellent build quality. And this 1977 direct-drive turntable is a perfect exhibit. A classic professional grade turntable from 1977. The JVC JL-A40 is a semi automatic direct-drive model featuring an sophisticated electronic servo motor with a specified wow and flutter of less than 0.03%. By the latter 1970s many of the high-end audio manufacturers were introducing plastic plinths throughout their turntable range. However these plinths are not to be confused with the light-weight cheap plastic turntable plinths of the 1980s. And this JVC especially so. Firstly the the JL-A40 is very solidly constructed and weights 7.2kg in total. Secondly it incorporates a parallel isolation suspension system that utilises coupled rubber dampers and coil springs to soak up shakes, jolts and jarring giving this turntable a good degree of immunity to jumping. Other features that JVC built into this model include an ‘auto-reject’ feature to prevent your stylus from grinding in the last grooves of your vinyl, a cueing feature, anti-skate, an adjustable height tonearm, pitch control and strobe light. It was also fitted with a statically balanced S-shape tone arm to correct tracking errors. The icing on this cake is that it comes with JVC’s very own high-end Z-1 moving coil cartridge. This cartridge is designed for 2-channel and 4-channel playback (including CD4) and features a wide range, clear definition and transparent tonal quality. Fitted with a Shibata Stylus that places less load on record grooves than elliptical styli, it follows the groove contours more faithfully thus improving frequency response. Furthermore it’s low mass moving structure extends the frequency response to 50 kHz. Other features include a Beryllium Cantilever (better than Titanium), One-Point Suspension, a Light Weight Cobalt Samarium Magnet and Laminated Permalloy in the Pole Pieces. All up this turntable is setup to enjoy beautiful sounding stereo and quadraphonic in both SQ and the superior CD4 format – another innovation brought to you by JVC! Originally based in Cambridge, Massachusetts, Acoustic Research is a celebrated high-end audio manufacturer famous for their revolutionary classics such as their AR-3 series, and are still in existence today but under new ownership. The AR48S represent the last of Acoustic Research’s classic series of speakers and were introduced in the final year of the Golden Age of Audio in 1981. They were offered until around 1983. Note the AR48S should not to be confused with the post-classic AR48B and AR48BX speakers produced later. Sporting a 10″ Acoustic Suspension Woofer, 4″ Mid Range and 1″ Dome Tweeter and were designed for amplifiers rated between 15 & 100 Watts. As a 3-way speaker with a 10″ suspension woofer the AR48 is the natural evolution of the AR2ax and saw improvements with brighter sound and excellent dispersion characteristics. While the AR48S doesn’t yet have the vintage recognition of say the AR5, their performance is very impressive. Their mid-range and high’s are excellent and well dispersed and they sound great even when your positioned closely to the speakers. Some criticise these speakers for a lack of bass, but you must remember these are sealed enclosures and in a bookshelf format designed to give a more natural sound. If you want thunderous bass then look for a combination of either a ported speaker or a large floor standing model. I personally find the bass sufficient for most music genres, but I understand if you would want to round it out with the addition of a subwoofer, especially if you are in to electronic music. IMHO these speakers would be a perfect match for many mid-to-late 1970s Amplifiers and Receivers. Aesthetically these speakers suffered from the trend that began in the mid-seventies to replace real wood with laminate. We can’t really blame AR for this as they weren’t alone, typically most high-end manufacturers from this era were guilty of introducing laminate into many of their models. At least the laminate on the AR48S is better than most and is thick and has not suffered peeling as is so commonly seen with laminate of this vintage. These particular specimens have some minor cosmetic issues; there are some marks here and there, the cabinets have some ver slight damage to some corners, the woofer domes have dimples in them (does not effect sound), one woofer has a stain. Other than that they are functioning well and I would say they are in good vintage condition for their ~33 years of age. These gorgeous Jensen’s were built during the height of Receiver Wars during the Golden Era of Audio. Branded as the Lifestyle Series of speakers they were heavily promoted in Audiophile publications such as Stereo Review in the mid to late 1970s. The LS-4b’s were smack in the middle of this range of speakers. The Lifestyle Series featured what Jensen referred to as as ‘Total Energy Response’, which roughly translates as the ability to completely fill a space not just with noise but with detailed sound information. And for once the adverts are telling the truth! They do indeed have a very wide spatial dispersion of sound throughout the sonic range, filling your room with music, and they truly do immerse you in an enchanting musical experience. The bass is terrific, these speaker were made to party and possess an amazing SPL – they just make you want to get up and dance! And BTW the LS-4B were only the mid-range in this series! The LS-4b featured a 25cm Woofer, a 8.75cm Mid-range and a 5cm Dome Tweeter. Cosmetically it appears that Jensen managed to avoid the cheap thin laminate that many other manufactures had adopted at this time. Overall the laminate on the pair I acquired is in great condition with no major peeling occurring anywhere, though some tiny lifting here and there is evident. Remember these speakers are rapidly approaching 40 years of age and some folks on the internet have described some of these units as having muddy or sloppy bass response. This is likely the situation where some these speakers have been hammered long and hard and their electrolytic capacitors are just plain worn out. The solution? While not a cure all often replacing the capacitors in the crossovers will do wonders for the sound in an old pair of speakers, tightening up the bass and delivering clear mid’s and highs, this can be especially the case if the electrolytics are replaced with audio grade polymer capacitors. I haven’t recapped this pair as yet because I have been enjoying them the way they are, but if I do I will certainly post it here. Once upon a time a long long time ago in a Galaxy far far away from the Empire and Darth Vader, there was a Golden Age of Audio. And for a time within this Age a war raged on Planet Earth for over half a decade, the likes of which had never been seen before or since, and for a short time powerful High Fidelity sound was available to the average consumer. The Receiver Wars occurred during the ‘Golden Era’ of Audio (1971-1981) when the major HiFi manufacturers developed audio products that really were aimed at producing the finest musical reproduction as possible and multi-billion dollar corporations invested massive amounts into R&D to achieve this end. Commencing in 1974 and ending in 1979 the major manufacturers of retail HiFi components competed against each other in a ruthless all-out war to dominate the market and offer the most powerful, best sounding and most aesthetically stunning Receiver. They were selling to a wealthier and more intelligent market than today (it was before food additives, vaccines and sodium-fluoride had reduced the average IQ) and the general pubic were expected to be capable of interpreting things like Nyquist’s Charts and be familiar with terms like ‘harmonic distortion’, ‘slew rates’ & ‘frequency response’ which today are only reserved for that bizarre and tiny segment of the human population known as audiophiles. Receivers are an audio component that combine a tuner, pre-amplifier and power amplifier into one unit, so that everything you need to listen to the radio or other music sources in High Fidelity is contained in the one box – sans speakers of course. The company that invented the Receiver was Harman Kardon, however other manufacturers were quick to introduce their own Receivers to market. By the end of the 1960s, Receivers had become a highly popular audio component genre. Perhaps one reason for their popularity was their stunning looks, with their mixture of multi-coloured back-lit tuning dials, signal strength and alignment meters, VU meters and a multitude controls that all combined to produce something that looked remarkable. Next to these most separate components would just look, well bland in comparison. Receivers became a feature in the home, standing out without taking up a huge amount of space as the furniture based systems that had been so popular in the 1950s and 1960s. Traditionally audio purists will tell you that for the ‘best’ sound separate components are the only way to go, and normally this is the case. However as the popularity for Receivers gained – R&D funding soon followed. Receivers began to see refinements and performance that out-paced what even the best ‘high-end’ reference components could offer. Receivers had become the flagship products of audio manufacturers. 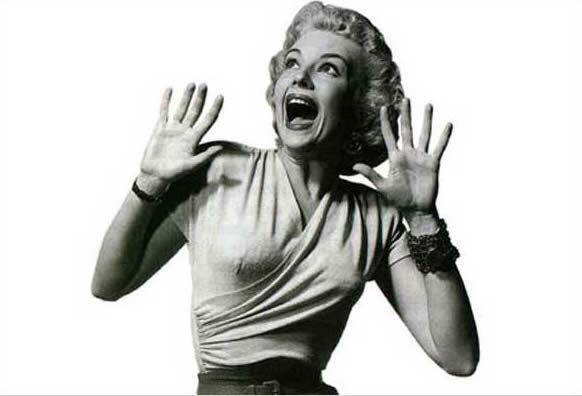 It was 1974 and two events would occur that would forever change the landscape of HiFi and trigger the ‘Receiver War’. The first event of 1974 was when the United States Federal Trade Commission moved to introduce a new and rigorous standard for rating the performance of Hi-Fi gear. While not perfect, and some argue it is not even measuring the correct thing, it was at least a step in the right direction. 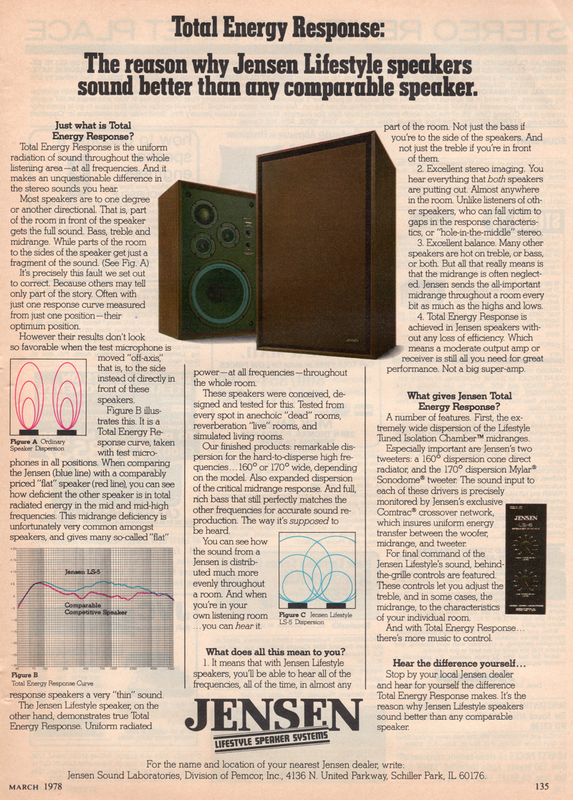 Prior to 1974 the audio market had suffered from confusion caused by a myriad of different power ratings making it very difficult to compare one brand to another in terms of performance. Often a manufacturer would pick a method that would give them the most impressive figure that they could quote in their marketing material, and there was very little control over how these measurements were made. The outcome of this meant that it was entirely possible you could purchase a 50 Watt amplifier only to find that your neighbours 10 Watt amplifier would drown yours out! The new FTC standard was directly aimed at combating the unrealistic claims being made by some manufacturers, and to arm the consumer with a rating system with which to compare one HiFi product to another. The new metric was known as RMS or Root-Means-Squared and was a punishing test for amplifiers using sine-wave signal voltage to measure the maximum output that an amplifier could output into a resistive load before ‘clipping’ or distorting. 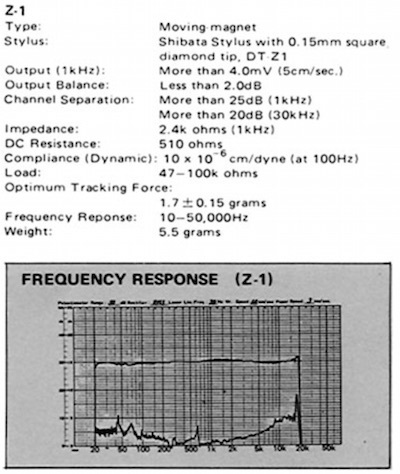 The RMS measurement was quoted as the maximum output in Watts an amplifier could produce with a corresponding measurement of harmonic distortion produced at that rating. 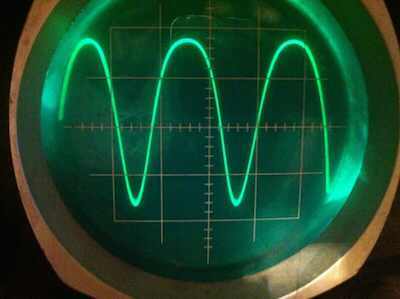 This measurement was taken over a given frequency range, typically 20-20000Hz. The second event to change the course of Hi-Fidelity History was when Pioneer – true to their brand name – released to market the first 100 Watts RMS per-channel Receiver as rated by the new FTC standard. And thus the first salvo in the Receiver War was fired. Ridiculously Good Looking!! Beautiful! Gorgeous! Stunning! Elegant! Timeless! And Miranda is not bad either! Miranda Kerr takes us behind the scenes at Spring Fashion week to blow us a kiss and show off a beautiful 70s Marantz Receiver and Turntable. 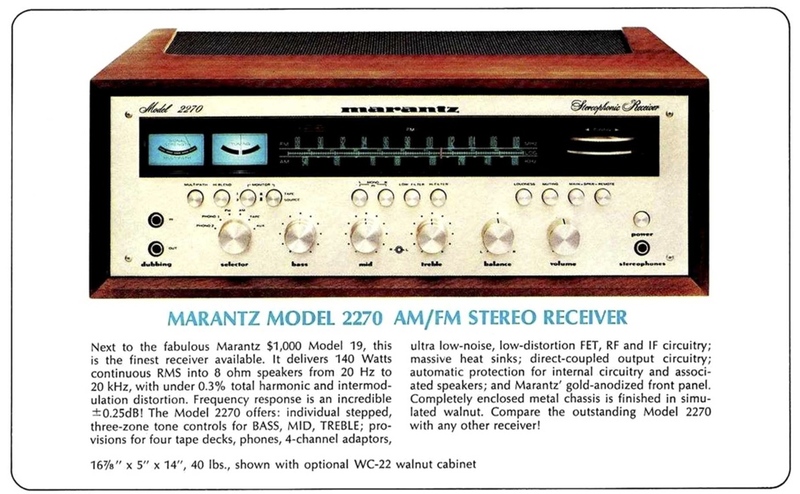 I believe what we are looking at is a Marantz 2270 Receiver from their 1972 Winter Catalogue. As for the Turntable I am yet to identify it, maybe somebody out there could educate me BTW Vintage Marantz is sooooooooo hot right now!!! 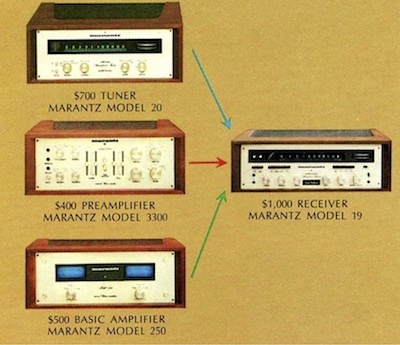 Marantz during this period were producing some of the most powerful receivers at the time, and many will attest that they were finest sounding as well! These are absolutely classic pieces especially when dressed in their optional walnut cabinets. All of these units are rarely seen in Australia and I highly recommend any one of these items if you have the means. The Model 2270 is a fabulous Receiver with heaps of power (70W+70W RMS) with that famous Marantz sound and was the ‘second best’ Receiver on offer during this catalogue year next to their ‘Model 19′ Receiver. I am not sure whose place Miranda is at in these photos, but it certainly indicates that it is someone with incredible taste and style! And obviously Miranda liked it in her shots too! Introducing the Worlds First 100 Watt Per Channel RMS Receiver. In 1974 some seriously good music was flooding the airways, Queen had released their “Killer Queen” anthem, Bowie had released Diamond Dog and Kiss had their debut album, but what Receiver could do these bands the justice they deserved? Thankfully this was the decade that saw solid state HiFi evolve from being cute little music boxes that sat in the corner of ones lounge room to Monster’s capable of scaring small children and women with weak bladders. Queen, Bowie and Kiss would not be disappointed! 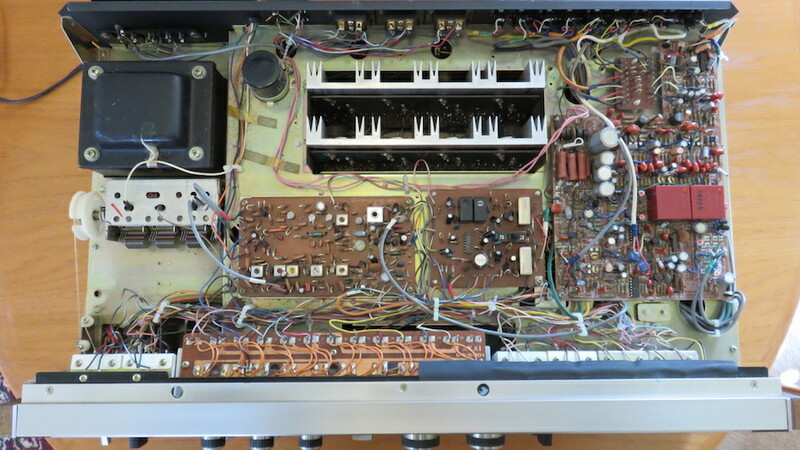 A stripped down Pioneer SX-1010 I’m working on getting ready for restoration. Stay tuned for details of this restoration. 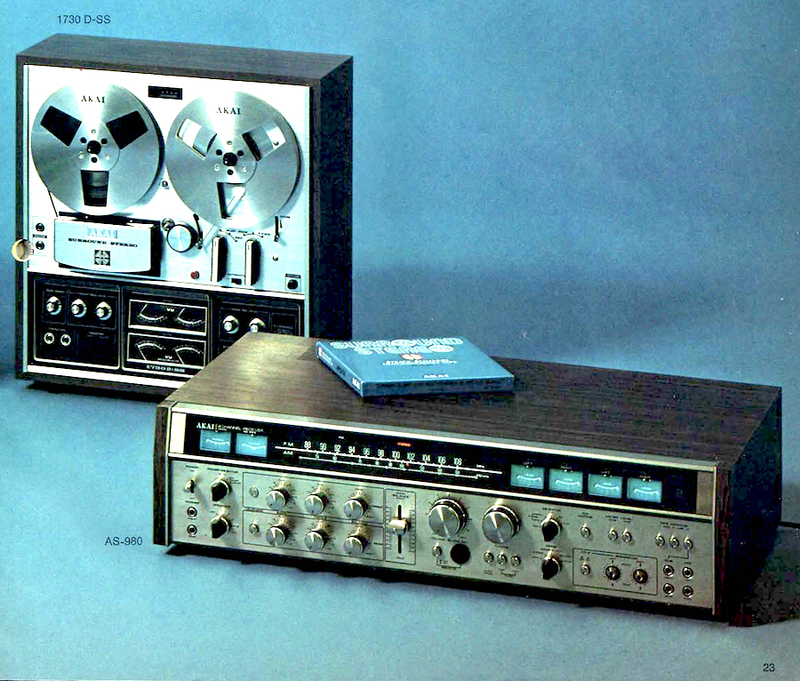 And the first of these Monsters was Pioneer’s top-of-the-line Receiver for 1974, the SX-1010. On it’s release was the most powerful receiver in the world! This iconic piece marks an important milestone in this history of HiFi for it was the first 100 Watt RMS per channel Receiver and was responsible for triggering the famous Receiver Wars of the 1970s. To break the 100 Watt sound-barrier Pioneer engineered this unit with dual positive/negative power supply coupled with two huge 18,000uf filter capacitors. All this was to drive it’s Direct Coupled, Parallel Push-Pull OCL Power Amplifier. The SX-1010 delivered the promised 100 Watts RMS @ 8 ohms per channel with only 0.1 THD, and did it with ease. It’s power supply capacitance to output watts ratio was amongst the highest ever seen, and as the decade rolled on other manufacturers would release units with higher watt ratings yet their power supplies could not compete with the SX-1010. This particular Receiver has a very dedicated following, with many preferring them over other Monster Receivers. It’s sound posses warmth and character yet it has a fantastically tight bass response, great detail, and tremendous headroom making it capable of far exceeding it’s power rating for brief periods, allowing your music to be heard in its fullest expression. Raw power was not the only feature that this receiver had going for it. Promoted as a ‘Command Center’ this unit had inputs for 2 turntables, 3 pairs of speakers, 2 tape decks, 2 microphones, 2 headphones, one aux input and separate connections available for external Dolby processors. 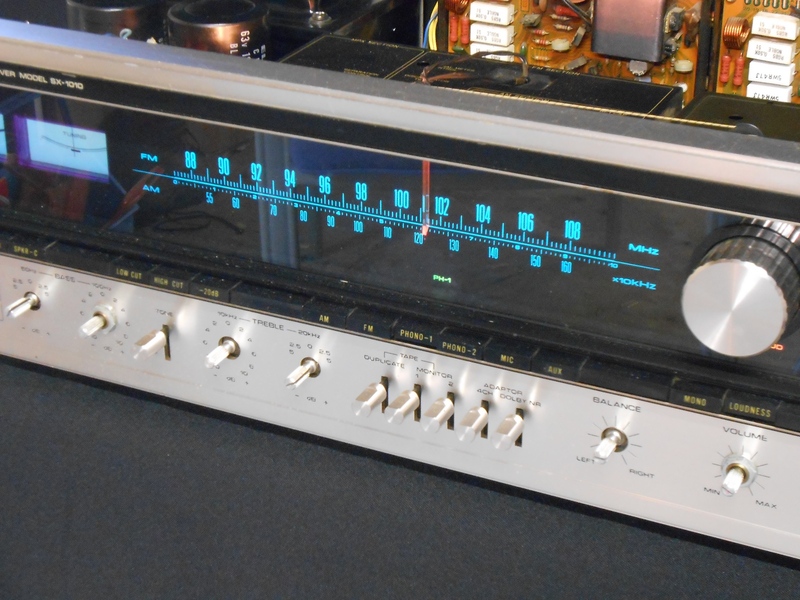 Also featured on this unit was Pioneer’s unique twin-stepped bass and treble tone controls that can custom tailor the listening experience to over 3,000 variations. There is also an option to connect a a 4-channel decoder allowing you to play quadraphonic sources. Style wise, this unit continued with the blue back-lit dial displays from the previous X2X series, but this was also the last of the Pioneer’s Stereo Receivers in which this was style was offered. 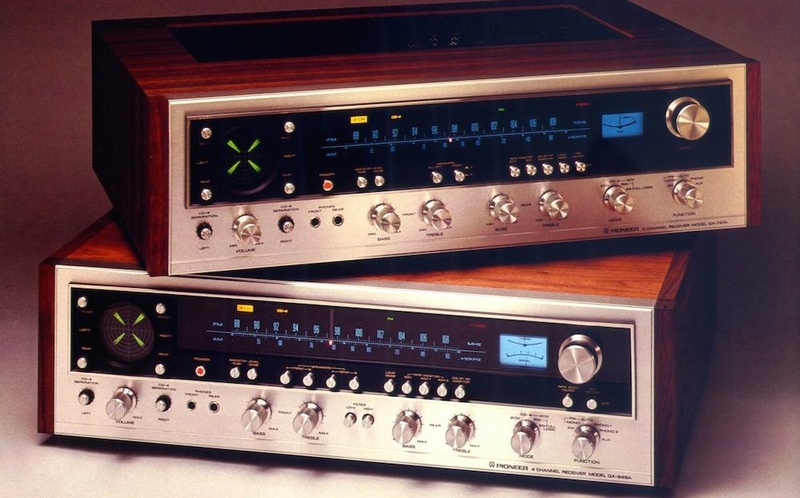 Wrapped in a beautiful walnut veneer cabinet with a warm orange-glow, this unit was also the first to incorporate the toggle switches that would feature on all Pioneer SX Receivers until the end of the decade. It also featured plastic push buttons arranged lengthwise across the base of the dial display for input selection and other controls each with an illuminated display to give you a heads up display on your chosen settings. 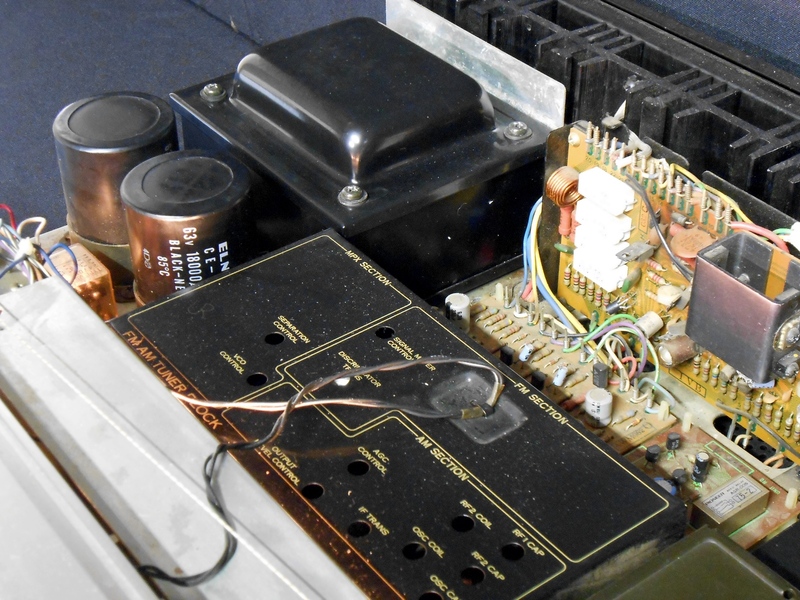 There is a presumption that for true hi-fidelity gear the best performance can only be achieved through separate component systems, this is certainly not true for 1970s receivers. Sure there are a myriad of cheap and nasty tape, record and radio combinations out there, but these are not to be confused with quality Receiver Amplifiers produced during the 1970s. Receiver’s were immensely popular high end units in the 1970s and hence were the flagship products offered by quality manufacturers, the effort that was expended during the Receiver Wars was testament to this fact. Often the latest and finest technologies found its way into the Receivers before trickling down into the remaining product line. 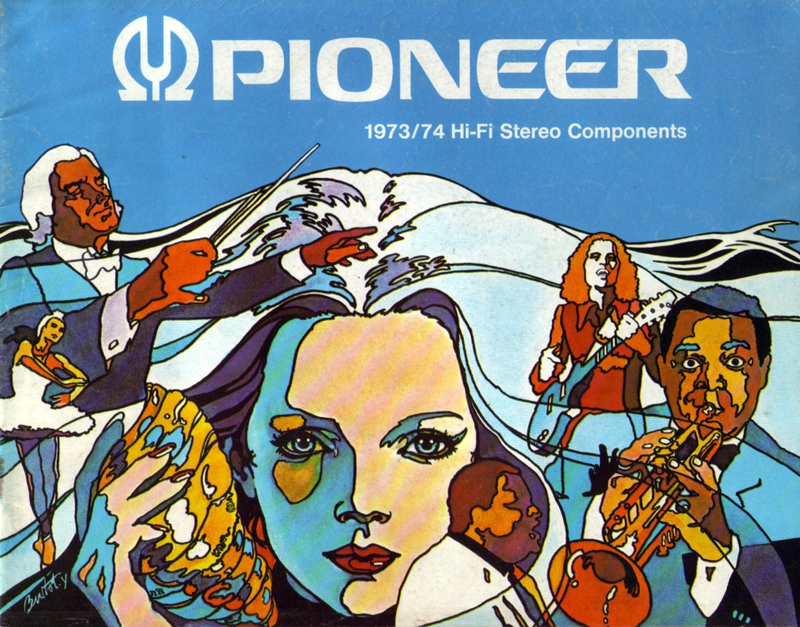 For comparison Pioneer’s top-of-the-line component amplifier available in 1974, the SA-9100, was rated at only 60 Watts RMS. 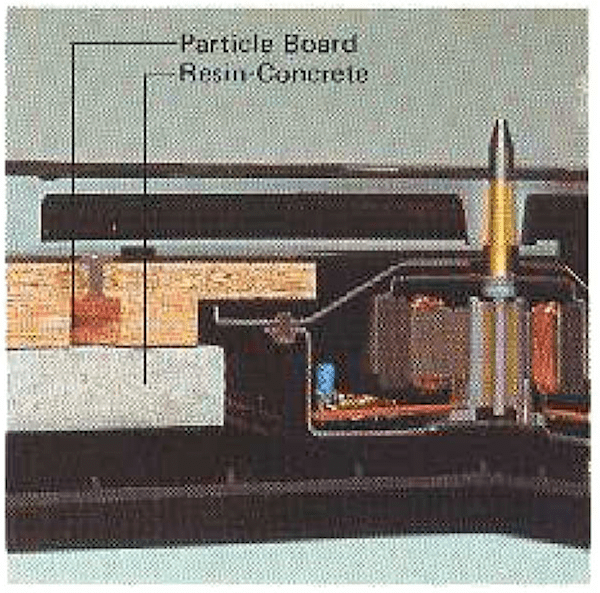 Many receivers internals were actually built as separate components with shielding provided for each section. Furthermore these Receiver’s also features pre-out’s allowing it to be paired with separate power amplifiers. 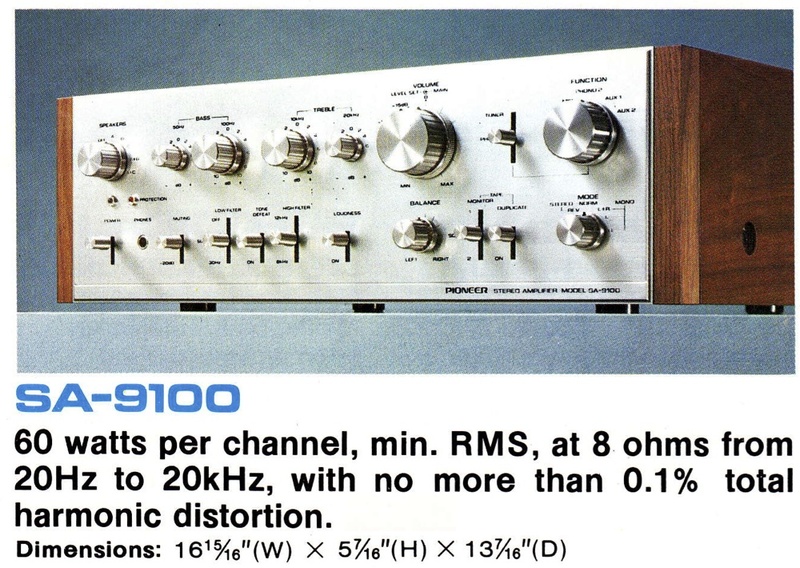 The AS-980 is Akai’s top-of-the-line Quad-Monster Receiver for 1973 through 1975. I decided to introduce the term Quad-Monster to differentiate these beasts from the top-end Receivers of the Receiver Wars while still awarding them the title of Monster. Why? 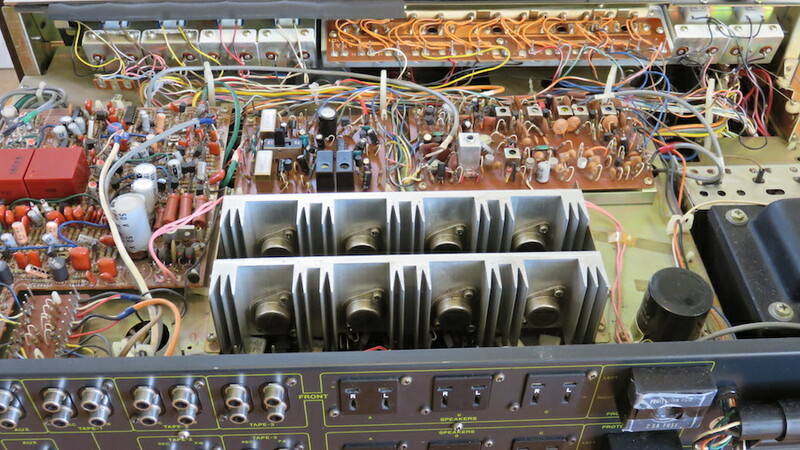 Most of the high-end Quadraphonic Receivers are typically physically impressive Beasts that possess huge dimensions needed to house the four separate amplifiers required. And the AS-980 is no exception, being the widest Receiver I have seen to date enter my collection it measures 66cm or 26″ wide – this is a full 10cm wider than my Pioneer SX-1980 Stereo Monster Receiver in my collection! I placed a coke can into some of the above shots to better enable the viewer to appreciate the dimensions of this Beastie! 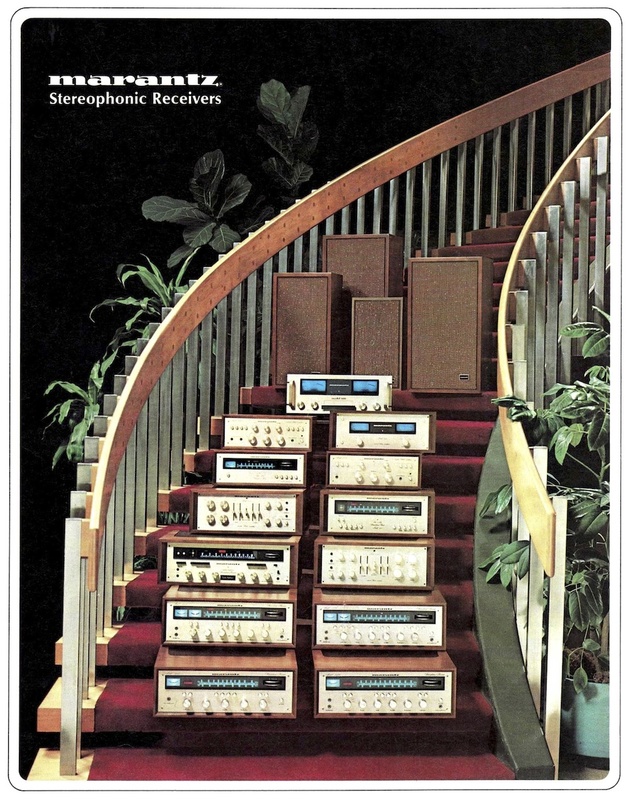 I love the early 1970’s adverts for HiFi gear. They are playful, sometimes naughty, and free from Orwellian Newspeak otherwise known as Political Correctness. 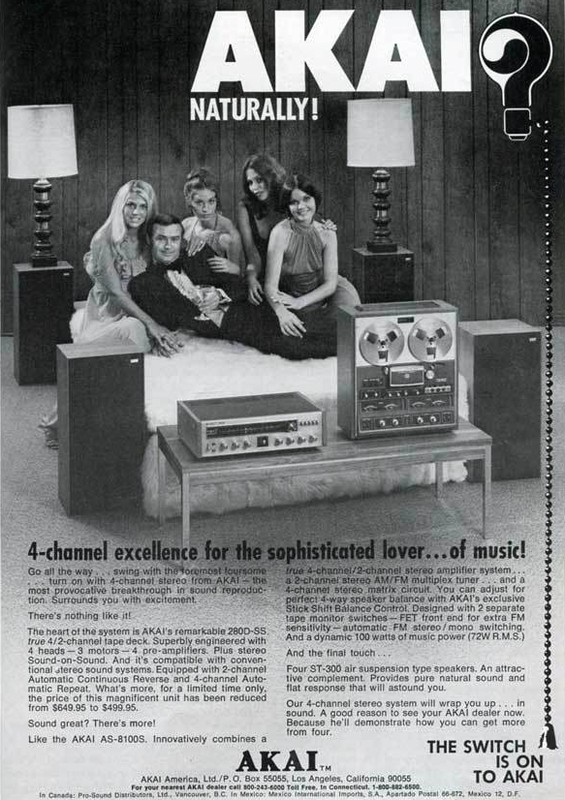 The early 1970s saw the major manufacturers embrace 4-channel Quadraphonic sound seeing it as the next big thing. Decades before Dolby Digital Surround was introduced Quadraphonic sound saw a battlefield full of formats and the consumers of the time must have been a little bewildered and confused about just which quadraphonic format to choose. 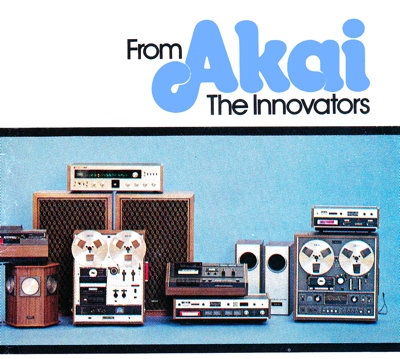 Akai’s solution to this quandary – pun intended – was to pack their high-end Receiver with every Quadraphonic Decoder available! As such the sheer size of the unit was also necessary to house all the controls and displays necessary for both stereo sound reproduction and the quadraphonic settings. You might think that you would need a Pilot’s license to operate this Beast, so I thought it might be fun to take a journey across the fascia. Moving from left to right the controls for mains power, speaker selection and the 2-channel or 4-channel mode selector. This Receiver accommodates up to 3 pairs of speakers allowing you to select a 2 pair combination for playback at any time. And in Quadraphonic this actually translates into 6 pairs of speakers in total with up to 4 pairs of speakers operating at any one time. So this amplifier while operating in a Quadraphonic mode could have 8 speakers pumping at once! The 2/4 channel mode selector switch is such a great feature because many other manufacturers placed these on the BACK of their Receivers and Amplifiers, and some even involved changing or rotating a plug that needed the use of a screwdriver! On this side of the display are the dual tuner controls representing tuning and signal strength. The next section incorporates independent Bass, Treble and Left and Right Balance controls for the Front and Rear channels. It also features independent Loudness controls for each of these channels, this is the only model I have come across to have this feature! Next to this is a linear potentiator for controlling Front and Rear Balance. Around these are placed some push button controls for Muting and High and Low Filters and a DIN plug for an external remote control, the Akai RC-4. I have been looking around for this remote, will let you know if I come across it. Directly above this the display features and attractive blue-lit tuner dial and illuminated pointer. The next section offers two dials. One gives the user a generous selection of inputs or music sources to choose from, including my favourite being two turntable inputs, as well as a MIC and an AUX option. Below this is a 4-channel mode selector offering options for Mono, Stereo, Discreet, SQ and Matrix. Right next to this is the CD-4 decoder controls. Again Akai was on the ball and thoughtfully placed the CD-4 separation controls on the Front Panel (many other manufacturers would place these on the rear of their units). Situated directly above the CD-4 controls is an FM Muting push button and Meter Level Controls to ensure no matter what volume you are listening to your music the VU meters are satisfyingly dancing away. The 4 VU Meters are on display directly above this. If your listening in 2 Channel – only 2 VU meters are lit up and on display, while in 4 channel modes all 4 light up Next to these is also the attractive 4 channel mode light to let you know that the amplifier is operating in 4-Channel mode. Finally we complete our journey and have finally reached the far right of the fascia where we discover the selectors for 3 Tape Monitors giving you even more input sources with output as well. Perfect for connecting into your PC or Mac. And a front panel MIC and DUBBING inputs. And lastly but a very important feature that should not be overlooked is that this unit came with a multi-voltage selector, meaning you can take this unit with you wherever you wish to travel and with a small adjustment you can operate it on any power-grid around the world! This beauty is jam packed full of amplifiers, decoder and equaliser boards, every square inch of space has been fully utilised here. Everything is built upon its own separate board. The amplifiers consists of a direct-connected pre-amplifier and a double-push-pull Darlington configured SEPP-ITL-OTL Power Amplifier. In stereo mode this setup produces 50 Watts RMS per channel at 8 ohms while in Quadraphonic Mode it generates 32 Watts RMS per channel at 8 ohms. This unit is powered by a dual +/- power supply consisting of a large laminate-core transformer. In this configuration only a single large smoothing capacitor is directly integrated to the power supply circuit while other smoothing capacitors are built into the power amplifier boards directly. An advert for a complete Akai Quadraphonic System with a debonair Bond like character with a martini. 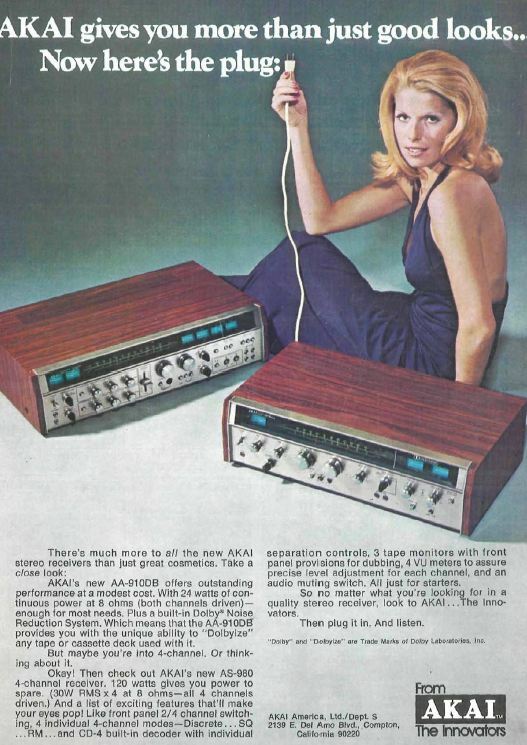 If only I’d known sooner that the secret to success with women was a 4 Channel Akai HiFi! Or perhaps this advert is trying to say that listening to an Akai 4-Channel system feels like the warm embrace of 4 lovely ladies? It is finished with a genuine wood veneer case and dark brushed aluminium fascia and all up weighs an hefty 20.5kg! What doesn’t translate with the technical specs is it’s sound. Warm, silky and detailed sound with heaps of low end is what you can expect from this Receiver. You will want a large room to play this Monster in so you can enjoy it in it’s full glory. 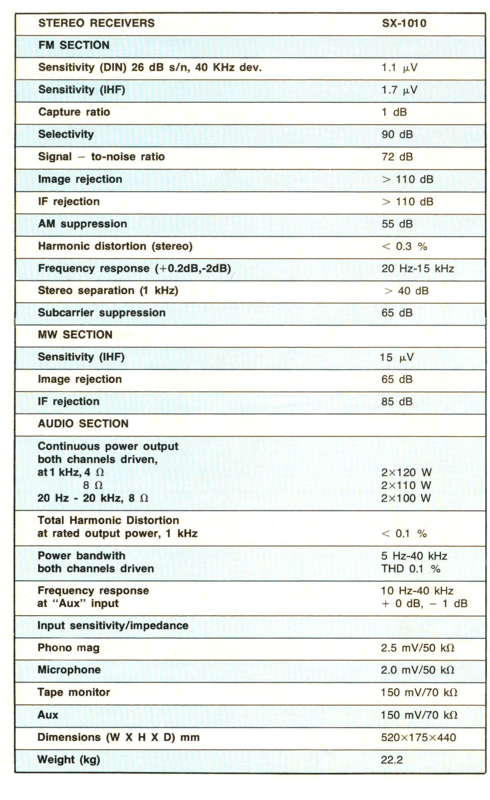 It’s decoders are excellent and you can achieve brilliant channel separation in it’s various Quadraphonic modes. Many quad amps suffer from lack of power, but not this bad boy, it is the second most powerful Quadraphonic amplifier in my collection, and I am almost certain this was the most powerful quadraphonic Receiver in 1973. Mine admittedly get’s most use in Stereo playback, but with just a flick of a switch it’s ready to play quadraphonic! 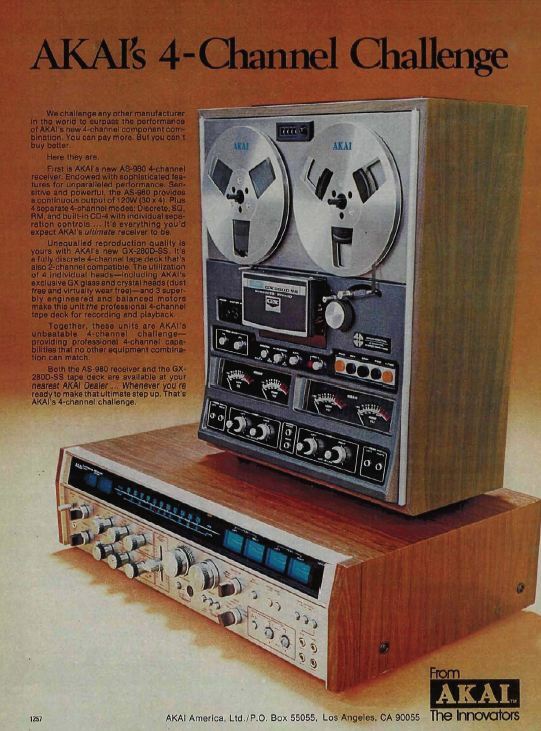 This unit would also be fun to setup for 4-track recording either to digital or reel-to-reel. It is seriously is one of my favourite Receivers (for both Quad & Stereo) for it’s unique styling and sheer size and I just love its character, warmth and power and I currently prefer it over any Sansui I have auditioned to date! I am currently restoring Pioneer’s King Quad the QX-949A, when I am finished I am looking forward to running these two head-to-head! 2-Channel Mode: 50 Watts (x2) Continuous Power Output @ 8 ohms. 4-Channel Mode: 30 Watts (x4) Continuous Power Output @ 8 ohms. Please ignore the 1978 in the above slider, that’s my bad! While I am calling these speakers ‘Vintage’ but to be truthful I have yet to come across any information about when these speakers were produced. 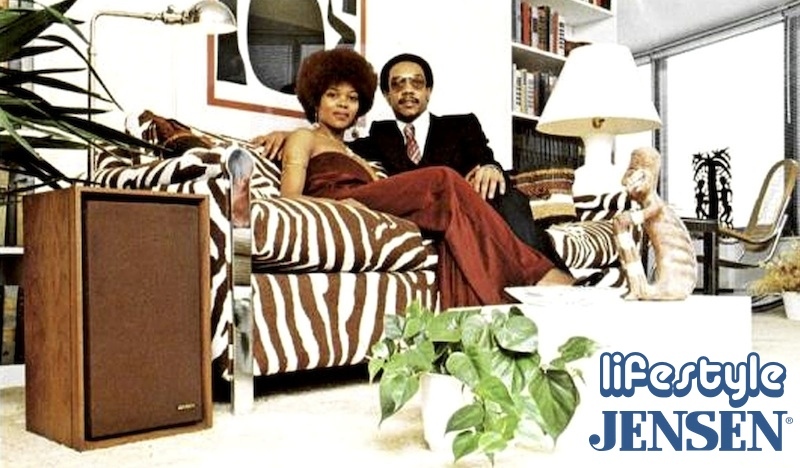 I contacted the firm that owns the Jensen brand today and even they know nothing about these speakers! So lets start by describing what these speakers are! They are 3-Way ported speakers are rated at 8 ohms 70 Watts. It features a 12″ sub-woofer, 5″ mid-driver and a 3″ tweeter. Overall these speakers are in good vintage condition and I think they look great. On close inspection the vinyl has been touched up in places and has imperfections, alas it is the curse of the late 70s thin laminate! I recapped with audio grade polypropylene capacitors of the correct specification. These speakers offer big sound with a decent mid-range, and the high’s are well formed and not harsh. These speakers look great and would suit a wide range of vintage 70s amplifiers and receivers.